There have been exciting developments in compact self-shielded cyclotron technologies. The main applications of these cyclotrons are to widen the availability of clinical PET imaging to remote sites that cannot be served by delivery or (more importantly for the UK) to make production of 11C radiotracers feasible outside the major PET centres (London, Cambridge, Manchester). The University of Hull has placed itself at the centre of the development and testing of this new technology. We installed an ABT biomarker generator, the first small commercial self-shielded cyclotron (7.5 MeV), used for 18F production together with ABT’s integrated tracer unit for producing standard 18F tracers with a compact QC system. We are carrying out research with ABT Molecular Imaging to validate the applications of this next generation cyclotron and using it to supply isotope to allow us to progress with new radiochemistry and preclinical imaging research. 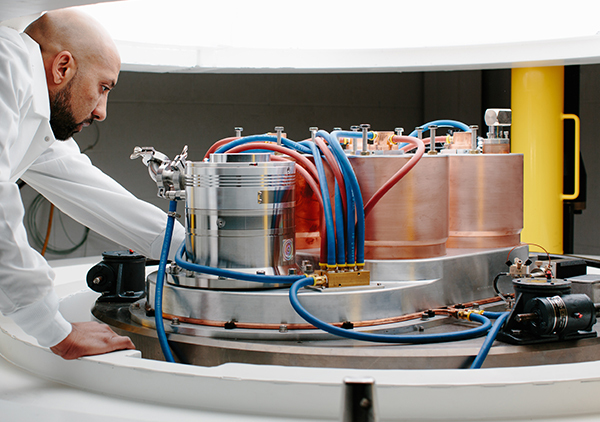 The University of Hull is the only UK site to have a research dedicated cyclotron for preclinical research. This allows us to focus on new tracer development and delivery of research projects with academic and industrial partners.